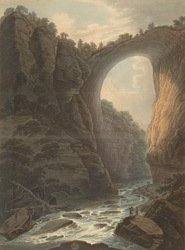 "The Natural Bridge, is the most sublime of Natures Works… Though the sides of this bridge are provided in some parts with a parapet of fixed rocks, yet few men have resolution to walk to them and look over the abyss. You involuntarily fall on your hands, creep to the parapet and peep over it. Looking down from this height gave me a violent head ache".